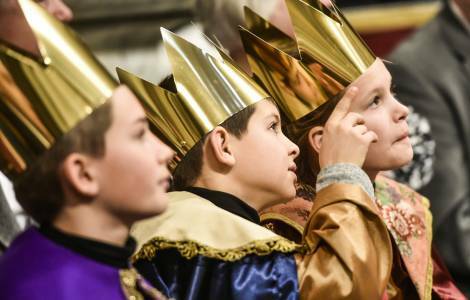 Aachen (Agenzia Fides) - For the 59th time, in the days leading up to January 6th, the "Star Singers" (Sternsinger) of the Holy Childhood Association in Germany will be on the country’s street-corners singing Christmas carols. "Bringing the blessing, to be blessing. Together for creation. In Kenya and around the world! ": is the motto of the 2017 Campaign, according to information sent to Agenzia Fides. By participating in the 2017 Campaign, the Holy Childhood Association of Germany (Kindermissionswerk/Die Sternsinger) learn how important their commitment is for children who are directly affected by climate change. The example of the Turkana region, the poorest and remote area of Kenya, explained in various materials prepared for missionary animation among children, shows the dramatic consequences of climate change for the people who have less responsibility. "With their commitment German children build bridges with the children around the world" emphasizes the National Director of the Pontifical Mission Societies and Holy Childhood in Germany, Mgr. Klaus Krämer. Dressed in their costumes of Magi, with their Star and their songs during Christmas time and in the early days of the new year the "Star Singers" go around visiting German homes. About half a million children from Catholic parishes in Germany will carry the "C+M+ B" blessing ("Christus mansionem benedicat - Christ bless this house") to the families, collecting donations for other children their age who suffer throughout the world. The "Star Singers" collection in Germany has become the largest solidarity initiative in the world, allowing children to help other people their age who are in need. ASIA/INDIA - Cardinal Gracias: "Climate change affects the poor and women"